Focused skill-building with 1:1 support. Cohort 1: February 19-22 and May 7-9 – SOLD OUT! Cohort 2: April 23-26 and July 17-19 – SOLD OUT! Cohort 3: September 17-20 and November 19-21 – SOLD OUT! To be put on a waiting list, contact Brittany Engle at bengle@kansasleadershipcenter.org. Each Lead for Change participant will receive a personal, highly skilled coach to join you on your journey. You’ll meet five times both on the phone and in person to discuss what’s holding you back and to design actions to move you forward. We all at times hold assumptions (some true, many false) that limit our ability to face the deep challenges where we’d like to see movement. Through a structured process, you’ll evaluate your own assumptions with an emphasis on breaking through limiting beliefs to achieve measurable actions. Curious about why you are stuck and what makes change so difficult? Immunity to Change guides you through an effective process to make progress on your personal, adaptive challenge. Uncover what is holding you back from success and learn a new path forward through experimentation. What is Lead for Change? We know people working to create significant change need steady support. By attending Lead for Change you’ll join others from all sectors and levels of authority with a common aspiration: to move forward on what you care about most. We’re looking for dreamers, those with aspirations for large-scale change both within yourself and within the systems where you live and work. Our leadership framework has helped thousands more effectively diagnose situations, manage themselves, intervene skillfully and energize others. On top of a deep dive into the KLC leadership framework, you’ll gain tangible skills, evaluate assumptions holding you back, receive personalized feedback through a Emotional Intelligence assessment and work 1:1 with a leadership coach who will challenge and support you in your efforts to move forward. Lead for Change is our most extensive offering aimed at helping you deeply invest in the challenges facing you. Join a community of others with skills and support to move forward. *Limited scholarships are available for individuals requesting assistance with registration fees. For more information regarding eligibility criteria, click here. *Participants are required to purchase the Kansas Leadership Center Handbook before arriving. Details regarding book purchase and pre-work are included in an e-mail you’ll receive upon registering. Have questions or want more information? Contact Brittany Engle at bengle@kansasleadershipcenter.org. 3-month free access to Your Leadership Edge, an online experience packed full of videos, webinars, leadership tips and tools to continue equipping you to lead. 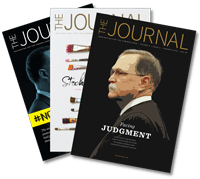 A subscription to The Journal, KLC’s quarterly print and online magazine featuring stories of people in communities and organizations leading.